The OBS software isn’t available – or it crashed. The lights turned on but there is no video or a solid blue background on screen. The lights turned on but there is only a solid white background on screen. I need test patterns to help setup of focus and exposure. I would like to collect usage statistics. Solution #1: If you are using the latest version of the OBS App, follow these steps. Once out of full-screen, navigate up to the “One Button Studio” text at the top-left of your screen and click on it. This will bring up a dropdown window with a few options. Select “Preferences” from this list. 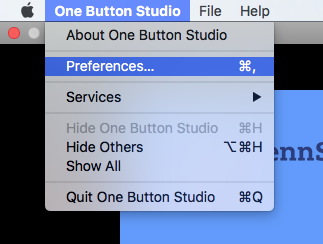 This will bring up the Preference Panel for the One Button Studio. Your usage statistics will be shown at the bottom of this panel. It will list the Number of Videos recorded, and also the Time for all Recorded Videos. NOTE: You will notice a “Reset Counts” button to the right of your statistics. This button will reset these numbers, so be sure to write down your numbers before clicking reset. You will want to reset the counts before the next semester, so your numbers in the app stay current. Clicking reset will not delete these videos from the computer. 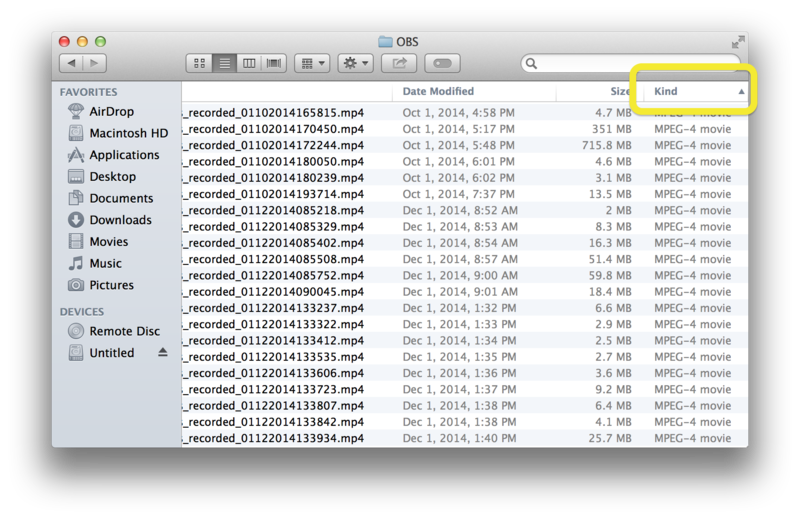 For a tutorial on deleting videos to free up space on your Mac Mini, please see this tutorial. For Penn State Media Commons One Button Studios only: You should be contacted by your campus’ Media Commons Consultant at the end of each semester, requesting these numbers. Please fill out this Google Form to submit your usage statistics for the semester. Thank you! Solution #2: If you are using Version 1 of the OBS App, follow these steps. This tutorial will explain how you can extract and compile usage statistics (number of videos recorded, total amount of time and data recorded) from your One Button Studio (OBS). This can be very useful for end-of-semester numbers, and tracking growth. The first thing you will want to do is to make sure there is a keyboard and mouse connected to your One Button Studio’s Mac Mini. If there isn’t already, simply plug a USB keyboard and mouse into the white USB dock, and that will allow you to access the computer. Now that you can navigate with the mouse and keyboard, exit the OBS application by pressing the esc key on your keyboard to return to the desktop, and then by closing the application like you would any other Mac application. Next, double click on the Macintosh HD hard drive icon that should be located in the upper right corner of your desktop. This will bring up a new Finder window. From here, simply select the Movies folder in the left hand sidebar. 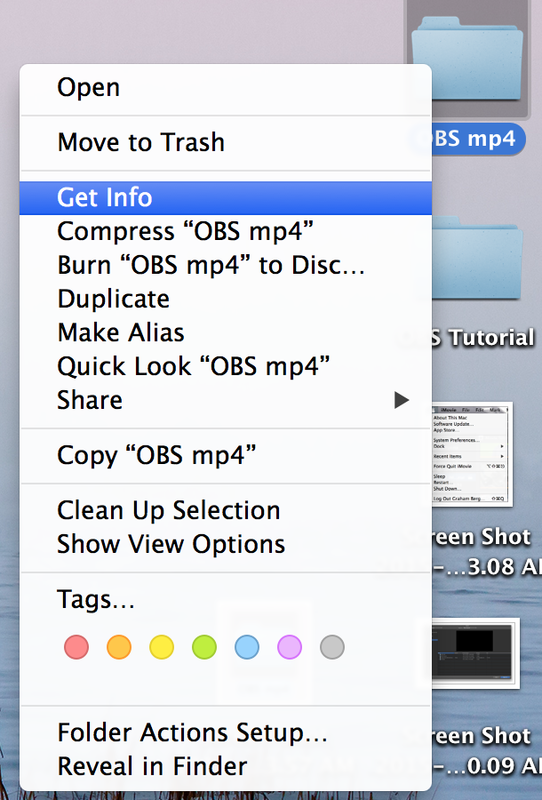 Then, double click on the folder called OBS. You will notice that there are three different file types for each separate recording. The file type that we need to worry about today is the .mp4. 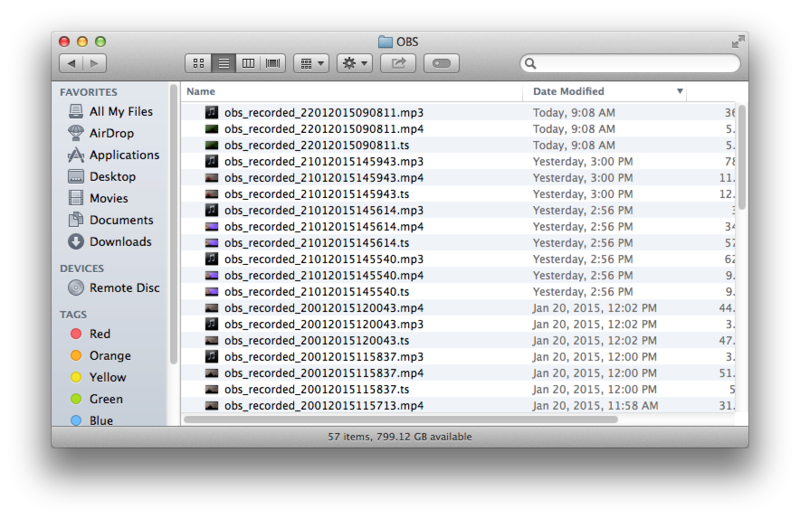 The other file types that you will see are .ts and .mp3 files. 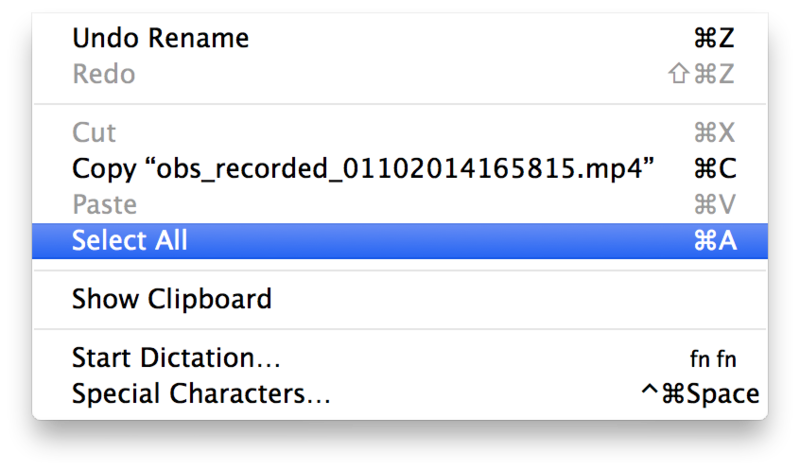 If you have a lot of recordings in the OBS folder, it will be easiest to select all of the .ts and .mp3 files and move them to the Trash. That way, you are left with only .mp4 files, which are the only ones you will need to focus on. To do this, in List View of the finder window, sort by Kind. This will organize the files together, so that the files are sorted by file type and easier to find. Now, find and select all of the .mp3 and .ts files, and move them to the Trash can in the right-hand corner of the dock at the bottom of your screen. With the .mp3 and .ts files deleted from the folder, you should now only have .mp4s. To make them easier to find, we will move them to a new folder on the desktop. First, go out to your desktop. 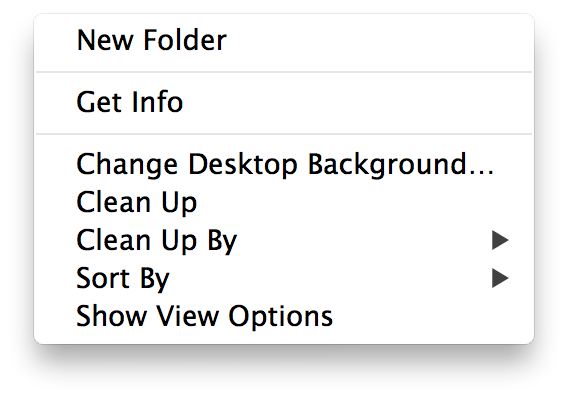 Right-click anywhere on the desktop, which will bring up a small menu, then select New Folder. This will create a new folder on your desktop. Underneath the folder icon will be the title untitled folder but you may wish to rename it. To do so, click once on the folder to highlight it, and then click once in the text underneath the folder. The highlighted text should turn light blue, and you can erase and type something new into the box. 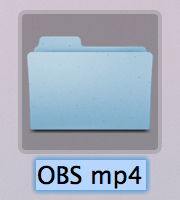 In this example, we have renamed the folder to “OBS mp4”. 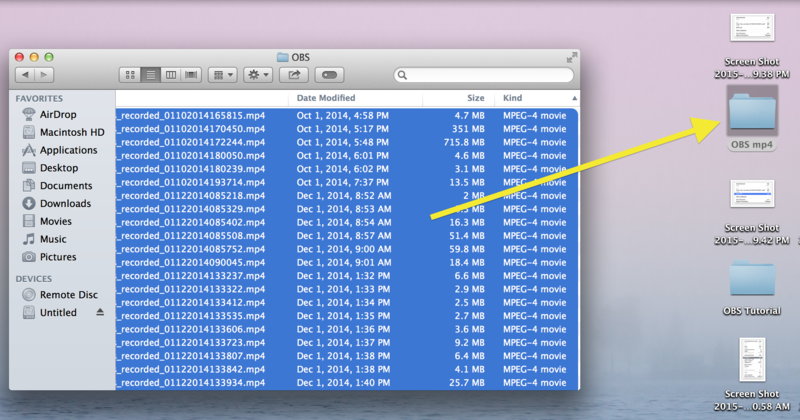 With the folder created, return to the Finder window with your OBS .mp4 files. We now need to drag all of those .mp4s into this new folder on the desktop. To select all of the files, go to Edit in the top menu bar of your screen, and click Select All. Every file should be highlighted in blue, and they can now be moved all at once. 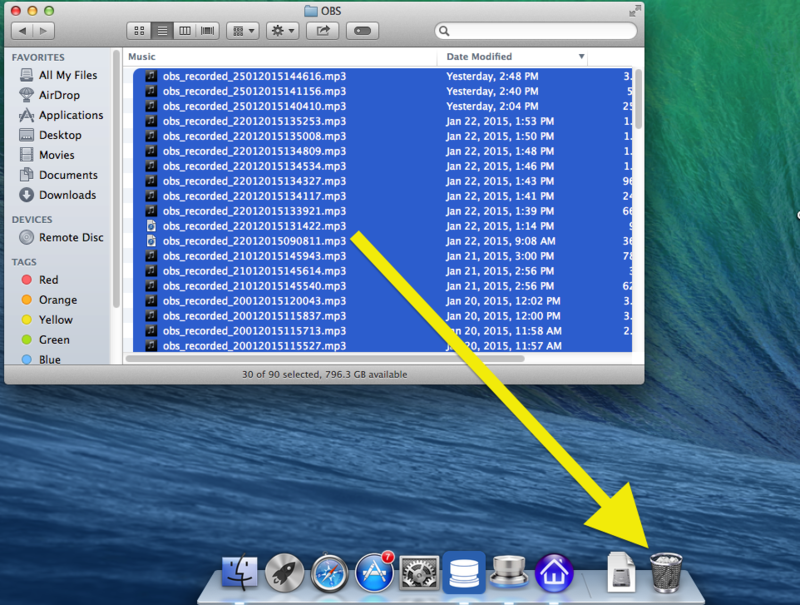 Simply click and hold on any of the files, and then drag them over into that new folder on the desktop. This will make these files easier to find in the next section of the tutorial. It will also give you the ability to check the number of videos recorded, and the overall amount of data recorded. To check this, simply right click on the folder, which will bring up a small menu. Then, select Get Info. A pop-up window will appear, which will tell you the size (amount of data) in the upper right hand corner, and the number of files in the section below the title. 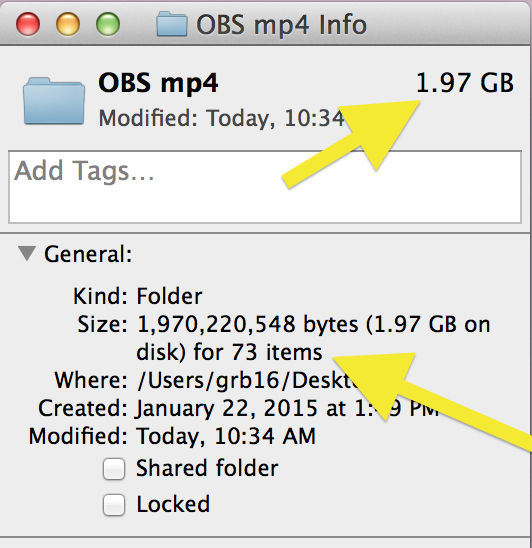 So now that we know where the .mp4 OBS recordings are located, we need to import them into iMovie. The result of this process will show you the duration of all of the videos combined. To do this, open up iMovie, which is located in the Applications folder. To get there, click on Applications on the left sidebar of the finder window that you already have opened. Then, scroll down to iMovie and double click on the icon to open the application. 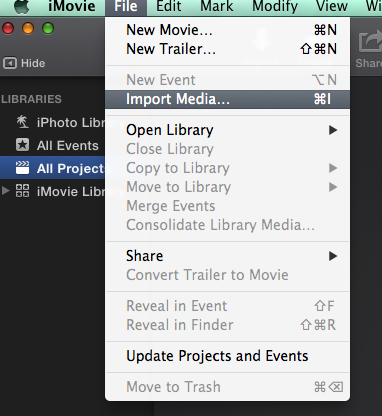 Once iMovie has launched, we want to import media. To do this, select File up at the top menu bar, and then choose Import Media. A new window will pop up. This is the Import Window. Within this window, we need to navigate to those OBS .mp4 files. To start, on the left sidebar of this window, select Desktop under the Favorites heading. In the bottom half of this window, you will see a list of everything on your desktop, including that new folder you created. We want to locate that folder, and then double-click on it. You should now see a list of all of the OBS .mp4 recordings. We want to import everything, so select Import All in the bottom right corner of the window. Once you do, the Import Window will close, and your files will start to import. Depending on how many videos you have, this may take some time. There will be a blue circle outline in the upper right-hand corner of iMovie that will gradually fill in as the import progresses. If you click on this circle, it will also give you an estimate of the time remaining to finish. Once all of your files have imported, it is time to create a new project to put the clips into. To do this, go up to File in the top menu, then select New Movie. A window will pop up asking you to select a theme, so select No Theme if it is not highlighted already, and then click Choose in the bottom right corner of the window. It will then ask you to name your project. This does not matter for our purposes, but you can name it whatever you like, and then click OK.
You now have a new iMovie project. You will see that your imported videos have moved up and to the left, into what is called the Events section of iMovie. There is also now a Timeline in the bottom third of the screen. We need to drag all of those clips from Events down into the timeline. To select every single video, click once on any of the clips in the Events section. Now, go up to Edit in the top menu, and click Select All. This will highlight every video in yellow. Once this happens, click and hold on any highlighted clip, and drag it down to the timeline. This will drag every one of your videos into the timeline. Now that all of the OBS videos are in the timeline, take a look at the center of the window. Right above your timeline you should see the title of your project, and right next to that is your project’s Duration. Since your project includes every single video recorded in the One Button Studio, this number represents the combined total time of every recording. The layout of this duration will be in Days:Hours:Minutes, or Minutes:Seconds depending on the length. 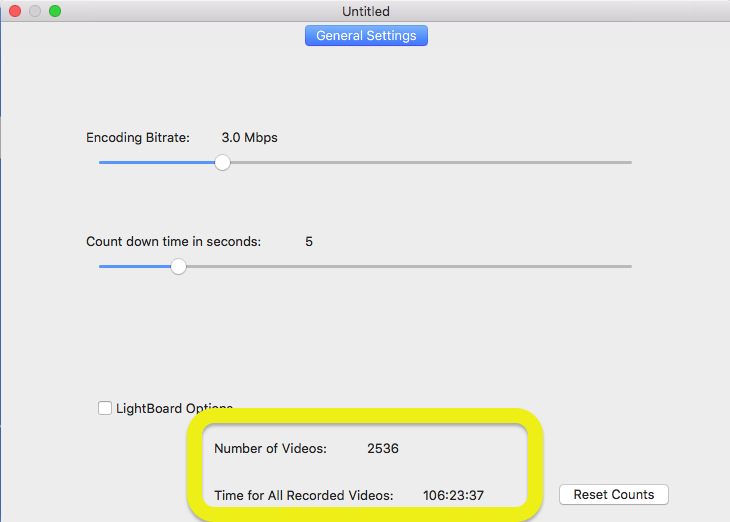 NOTE: If the combined total time of the videos is more than 24 hours, there is a chance that iMovie will get overloaded and freeze when you drag the videos into the timeline. If this happens, don’t worry! The total amount of time should still show up in your timeline. 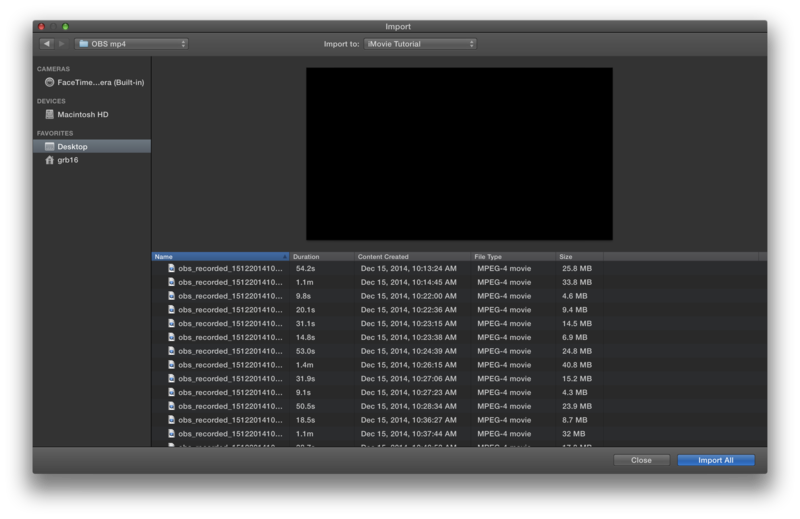 Make a note of the duration, then you will need to force quit iMovie. To force quit, click on the Apple icon in the top left corner of the screen, and select Force Quit. A window will open in the center of your screen with a list of applications that are currently running. 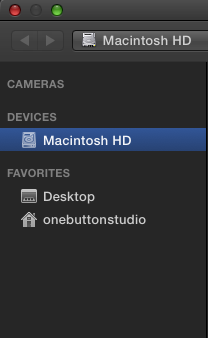 Select iMovie in this list, and then click Force Quit in the bottom right corner of the window. Now that we have all the information we need, it is a good idea to delete the iMovie Library to free up some space on the hard drive. When you import videos into iMovie, it essentially copies the files to the Library, so it will be taking up unnecessary space. 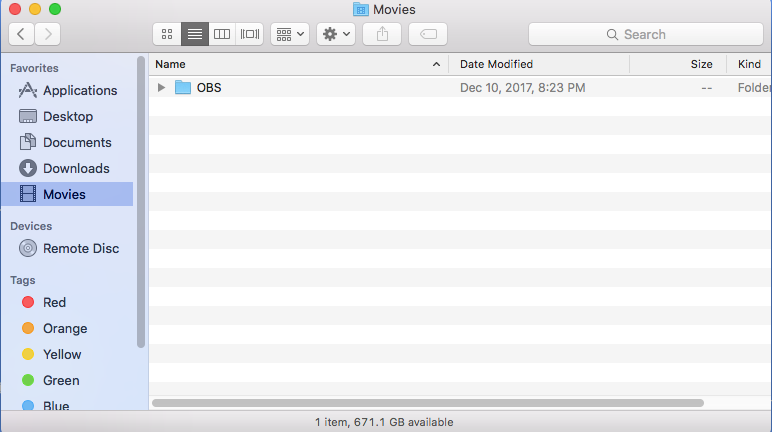 To delete the Library, open up a new Finder window and navigate back to the the Movies folder on the left-hand sidebar. 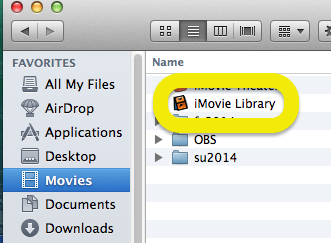 In this folder, you will see a file called iMovie Library. Drag this file into the Trash, and then empty the Trash. You may also want to move the .mp4 video files into a new folder with the semester as its name so that you can keep things organized going forward. That’s it! You should now have a few very useful statistics about how much use your One Button Studio is getting. Did this solution resolve your issue? Start over with this component. Choose a different component to troubleshoot. Contact the One Button Studio team. To learn more about the One Button Studio installation or about the technology, please visit our brochure site - onebutton.psu.edu.